Its a general theory, oil massage your hair and keep it over night. Get up in the morning and shampoo it to clean up the hair. Sweet one is considered the best by most of the people as it helps in achieving all the benefits mentioned above in 3 months if followed regularly. Almond oil is derived from the kernel of almond seeds. 1) Soft and Shiny Hair: Applying sweet almond oil overnight and washing your hair with Shampoo in the morning makes the hair soft and shiny in nature. The practice must be followed twice a week with a gap of 2 days in between. 2) Removes Dandruff: Almond Oil has high content of fatty acids that prevents the scalp from getting dryer. Fatty acids kills the fungus that generates dandruff. 3) New Hair Growth: Regular massaging your hair with oil and cleaning in the morning helps in opening the pores enabling the oxygen flow and helps in growing up of new hairs. 4) Prevent Scalp from Chemicals: Almond oil is a natural coolant which spreads itself into a protective layer over your scalp and prevents the roots of the hair from being exposed to chemicals. 5) Removes Dead Cells: Massaging helps in loosening of dead cells and fungus around the scalp that lead to dandruff. Since almond oil is very light, it forms an outer layer on the hair shaft, strengthening the existing hair which helps in preventing hair loss. 6) Acts as moisturizer: When we shampoo normal oil, it gets completely removed from the scalp. 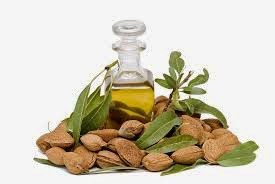 But almond oil has special property, it helps in sealing the moisture once shampoo is applied. Hence it maintains and increase the shine in the hair.